Is there one among us who hasn’t fantasized about inventing evil mechanical wonders? Perhaps a synthetic life form that can navigate to the living room and shoots nerf projectiles at a surprised spouse? Who hasn’t imagined creating an electroluminescent holiday masterpiece (like Phil Hassey did) or dreamed of becoming a kid’s hero for adding humble blinking lights to a birthday cake? So yeah, I bought a cheapo Arduino set. It was.. ok, I guess. Some pins were bent and the .pdf I found online for it was difficult to understand.. how do I even use all this stuff? But my taste hath been whet and must be satiated so I splurged on the real Arduino starter kit ($100) which is much better for beginner fools like me. An actual book! It’s worth the extra cost. I did about half the tutorials – made lights blink, switches switch, and a piezo whine annoyingly. No way that Zoetrope was ever going to spin right, did anybody get that working? It had to be something I could carry to bed or a restaurant and would just work. 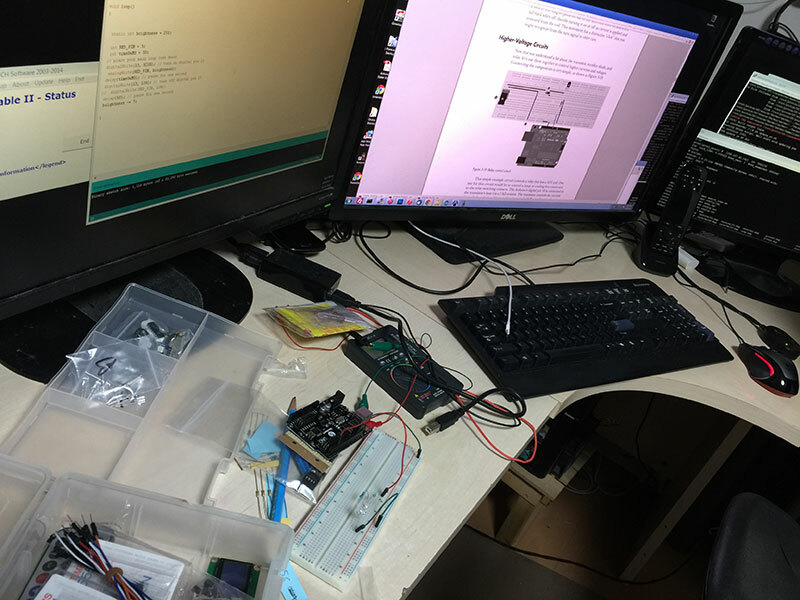 Doing something like that is really a challenge with an Arduino. First, to play audio, I ordered the Arduino Wave Shield ($22) and was overly proud when my amateurish soldering actually worked. I can now play 12 bit .wav files, yay. Have I mentioned I love Adafruit? They don’t just sell you stuff, they also have fantastic tutorials on how to use the thing you just bought – so buy from them! You know what? This Arduino Uno R3 is very limited. It’s ok at doing one thing – but when you start trying to stack things together you run into limitations very quick. Does the Wifi Shield even work with the Wave Shield? Would any pins be left over for lights? Would the program to do all this fit into 32k? You can forget about decoding mp3 audio unless you add hardware. So I set that aside and got a CanaKit Raspberry Pi set ($70 as I write this). Hey, wait a minute, it’s just a cheap, tiny computer! It’s marvelous. It can run linux, and has hardware pins to read/write to electronic things like lights and motors. You don’t need a Wifi Shield or a silly Wave Shield because it plays audio out of the box and you can just plug a USB Wifi dongle in. First thing I did was write a simple C++ program using gcc from the ssh command line. Next, I set things up so I could write/debug in Visual Studio on Windows, then had a .bat script running in the background to constantly rsync the entire directory to the Raspberry. You can download a neat package of linux-like tools that work with ssh and run on windows here. You’ll probably want to setup SSH keys so you don’t need a password. On the Raspberry Pi linux side, I setup a .sh file to run cmake and make in a loop for a continuous compile. I feel mean making it work so hard, but whatever. After compiling and running it in Windows, I just had to glance over at the ssh window to verify it worked under linux as well, or what the compile error was if not. Don’t underestimate the value of setting up scripts that allow you to be lazy like this. Workflow is everything! 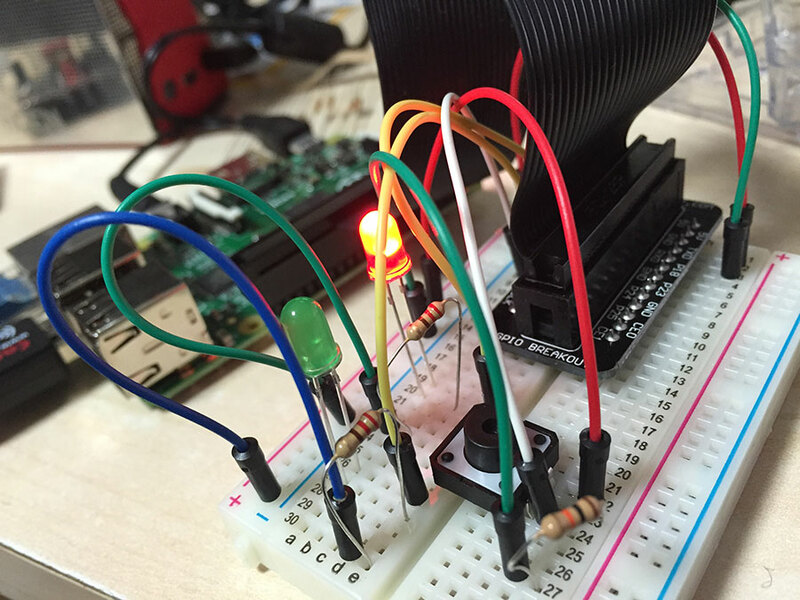 To get GPIO access (read/write the pins to control lights and motors) I used a C++ library I found called Wiring PI. Naturally that part doesn’t work in Windows (could write a fake interface that mimicked it and.. nah), so I #ifdef’ed that part out for Visual Studio. Parse what it gives back, and there you go. In the above pic, it’s working. The red light goes on for a normal Growtopia purchase (Gem’s Bag, etc), the green light flashes for a Tapjoy event. I have a little battery powered speaker connected to the Pi’s headphone jack to play audio for each event as well. The button on the breadboard toggles audio for Tapjoy. Audio and blinking lights will only get you so far, this isn’t 1950s scifi. 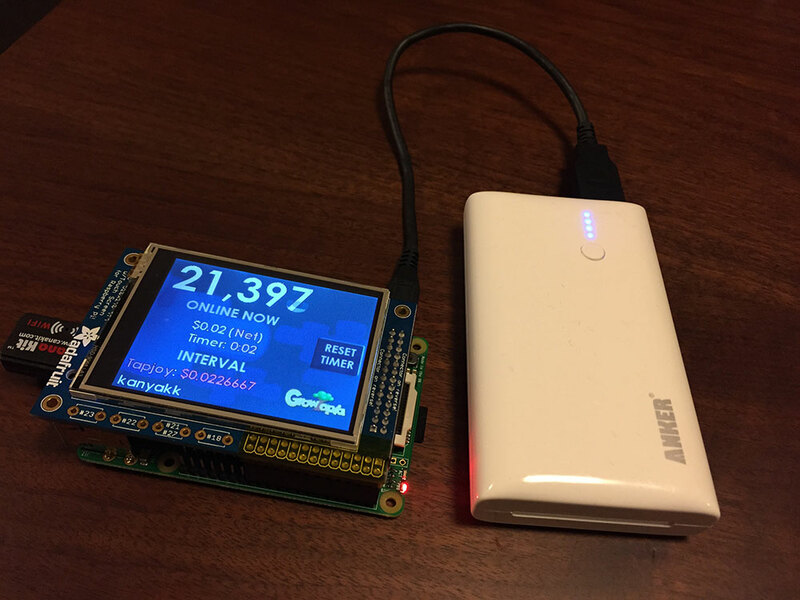 To show the active user count of the game I need a portable screen. The easiest would be a tiny monitor with an HDMI plug (raspberry has that built in), but I didn’t really see anything for sale that was cheap, tiny, and had low battery requirements. On the other end of the spectrum, there is a tiny two line LCD like this. 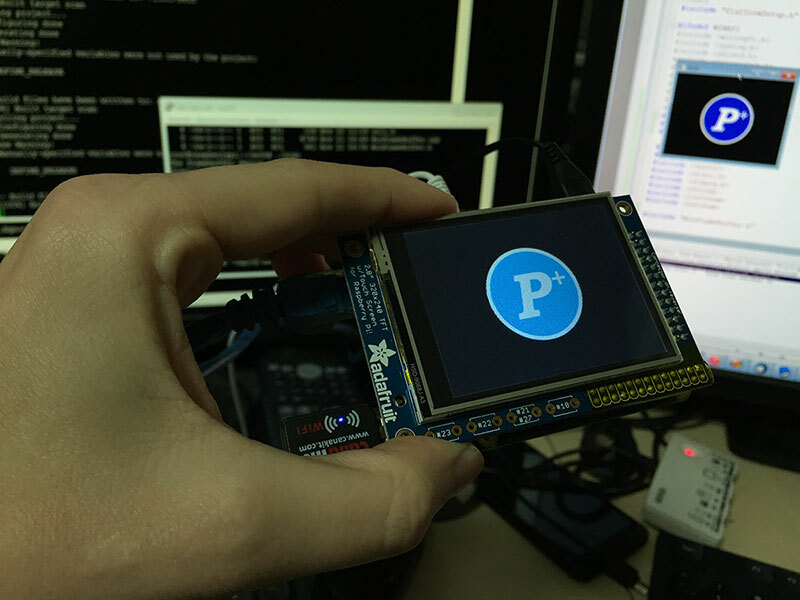 Nah.. oh hey, the Adafruit PiTFT, a 320X240 screen with touch controls for $35! Perfect. Unfortunately we have no GLES acceleration. So how do we do C++ graphics without GL? I considered trying to use something like Mesa (I use that on the Growtopia servers to render images, it’s a software GL solution) but.. meh, let’s be old school here. You just draw bytes directly to the frame buffer, like your grandparents did! I found some great info on framebuffer access and handling touch events on ozzmaker.com. Actually I guess there might be a version of SDL that will work with this screen (? ), but I’d prefer to use my own stuff anyway so I created a “Proton-Pi” lite version of Proton SDK that is modified to work with only SoftSurface instead of Surface (which is GL/GLES only) and only includes a subset of features. I could maybe make a demo app and zip it up if anybody wants it. It has no audio or Entity stuff. RTFont can now render directly to a 32 bit SoftSurface and then to update the screen you blit to the framebuffer. I think it gets like 15 fps. Would be faster without the slow 32 bit to 16 bit conversion on the final blit… but meh, who cares for this. The Linux stuff has been setup with the logon info of my home wifi as well as my iPhone’s hotspot wifi, this way it can be used anywhere, as long as I remember to turn on the hotspot sharing. After boot it automatically starts running the GT monitor program. I took it to a restaurant, it worked! But I ended up hiding it because when people logged off and the numbers ticked down the whole thing sort of looked like a homemade bomb or something and I didn’t want to creep everyone out more than usual. Well, it was fun but .. but alas, the cold hard reality hit me; I could have just written an iPhone app to do the same thing. (or as Phil pointed out, a web page, which would be the ultimate in portability) My end result has no cool physical buttons, servos, or even blinking lights. I just fell right into the old comfortable “programmers groove” of doing it all through software. Even though it sounded like I’m bagging on the Arduino in this post it’s still the perfect thing to use if you need to control something simplish with no boot times and low battery usage. This entry was posted in Development/RTsoft, Proton SDK, Tech Tips on January 17, 2015 by Seth.